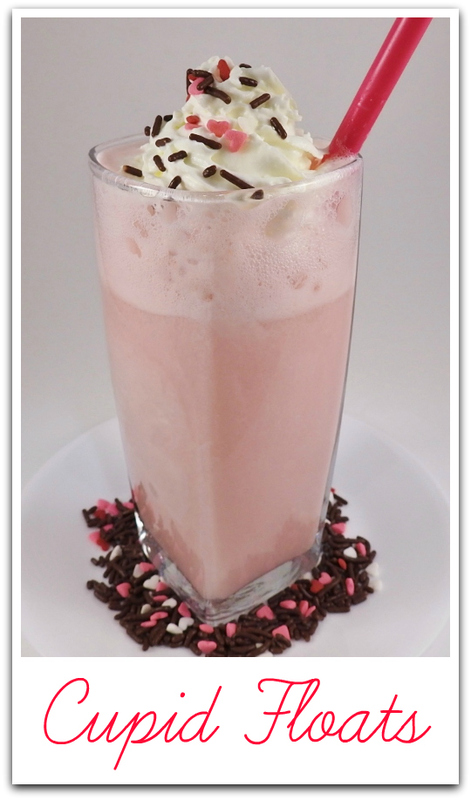 Cupid Floats- Perfect for Valentine's Day! Pinterest is flooded with recipes and crafts for Valentine's Day. I kept seeing variations of these Cupid Floats, and I thought they would be a fun thing to make with my son. Very simple- add a scoop or 2 of Edy's Vanilla Bean ice cream to a tall glass. Pour Cherry 7 up over it, tilting the glass and taking care not to let it foam over everywhere. I topped ours with some whipped cream and sprinkles. Thank you so much Stephanie from Somewhat Simple! Jake loved her idea of using a Twizzler as a straw but I didn't have any on hand. Scoop ice cream into glasses. Add soda. Top with whipped cream, decorate with sprinkles or a cherry. **This post has been updated in January 2019 with new photos and a printable recipe card. What a cute, simple idea! So festive for Valentine's Day! Quite a treat! Pretty, easy, and perfect for Valentines! Love this! Simple, delicious, and perfect for Valentine's Day . This is a great idea for Valentine's Day! What a fun and festive float! Such a pretty drink...perfect for Valentine's Day!!! This is so cute! Perfect treat for Valentine's Day! How fun! My kids would LOVE this! These are super cute and fun! Love the twizzler straw idea, too!